Evidence of a beaver in downtown Toronto? I live in the middle of a big, busy city (Toronto)and I crave wilderness. I found a magical spot in the middle of the city (a reclaimed 100yr old quarry)called "Evergreen Brickworks"
I have submitted a story and a few pics of this special place in the heart of Toronto in an earlier submission if you care to look it up. At any rate there has been some speculation that a Beaver has taken up residence in this oasis in the city. No conclusive evidence has been presented yet, but there is a lot of circumstantial evidence showing up EVERY day. 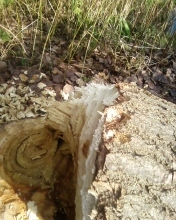 Yesterday I snapped these photos of a 20ft, freshly gnawed down tree. The smell of wood chips was fresh in the air as I turned the corner on the path and there was the "tree" I knew that this was the work of the "mysterious" beaver however a definitive picture of said Beaver has yet to be captured. The 1st two pics show the stump (freshly gnawed,) and the 3rd pic is a shot showing the full size of the tree resting on the ground. So what do YOU think? 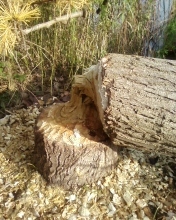 Could this be the work of a busy Beaver?? ?